There’s not long to go until the release of Jurassic World and at a guess, I say we could possibly see some sort of movie game tie in at some point over the year. 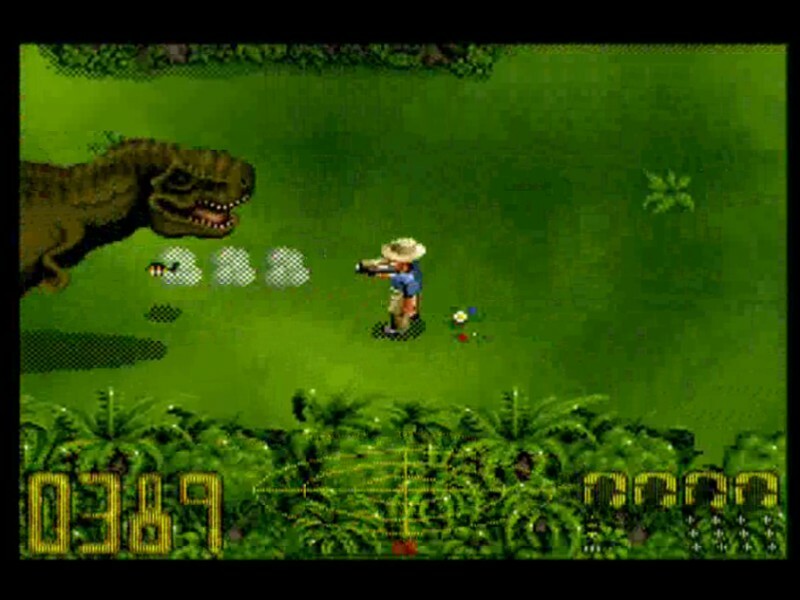 With that in mind, I dusted off two of the Jurassic Park games made by Ocean for the SNES in the 90’s. They made Jurassic Park games for other consoles at the time too, but each were different. These two are set loosely during the events of the first film with the second game sort of bridging the gap between the second movie. The games main menu screen is a little worrying, its so 2D, flat, bland, was this a bad idea? Lets just start up and see. Straight away we find that we’re controlling a little blocky looking Alan Grant, we can hop, jump and run up and down a little green patch of grass, seen from a top down view. Little dinosaurs are running all over the place, and when they touch you, the red meter indicating your health goes down, pretty standard for a video game. Now what do we do? The game gives you no directions as to where you have to go, so for the first few minutes you get torn apart by small dinosaurs or large raptors as you run around the compound below you. You find you have a tazer to fend off the dinosaurs but it really doesn’t help against the raptors. There is a fence to the north of the screen that electrocutes you if you touch it, that’s fun, right? 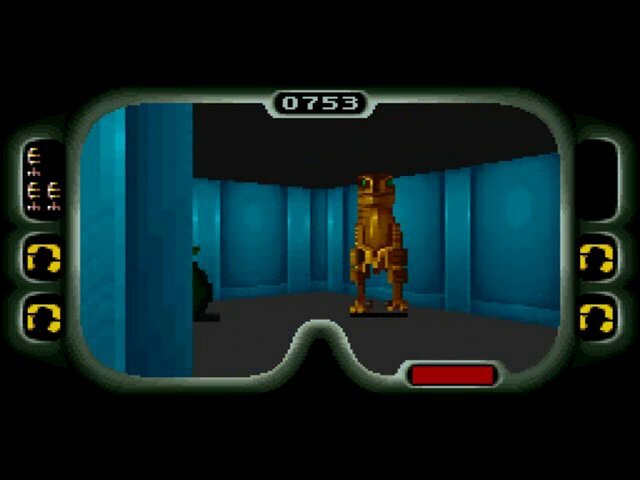 Eventually you find you can use the taser’s electric charge, to power the electric gate and run through, avoiding the dinosaurs just below you, while listening to one of the games many weird arcade tunes. They are the epitome of computer game music, but they actually work very well. So after a bit of exploration, you find you get points for killing dinosaurs, and that the dinosaurs explode when you kill them, for some reason. You start to find random objects on the ground, like dinosaur eggs, as you walk around the park, and you will do a lot of walking. If you pick up the eggs, Jeff Goldblum’s face will pop up on your screen, rather startling, telling you how many more eggs you have to find, but it won’t really say why you have to do this. If you stay still for a few minutes, a giant DNA strand with a face will appear on the screen with some neat ‘dino facts’ or something, it’s actually kind bizarre and reminds me of the old MS word paperclip. After a while, characters popping up on the screen becomes a regular thing and you get an idea of where you should be going. How about into that visitors center just ahead of you? You walk up to the door and enter the building. And this is where the game gets freaky. What the hell are we playing now? The game goes into a messed up first person view, complete with weird industrial goggle style HUD depicting weapons and ammo. You move forward into the building, and raptors run at you! You shoot… the raptors explode! Boom!… you find a locked door, its looking for a key card. Key card? Wait a minute, has Jurassic Park turned into Doom? In short… yes. You look at the ground and find that you can pick up a rocket launcher, because you know, Sam Neil needs a rocket launcher. To be fair, the game would be boring if you didn’t have some weapons and way to fight off your foes. The electric rod and sleeping gas make sense, you would expect the place to have them to keep the animals in check, even the shotgun kind of makes sense because of the hunter guy that was in the film. A rocket launcher is a bit overkill though, as is the weird ‘bolas snare’ that explodes raptors on contact. 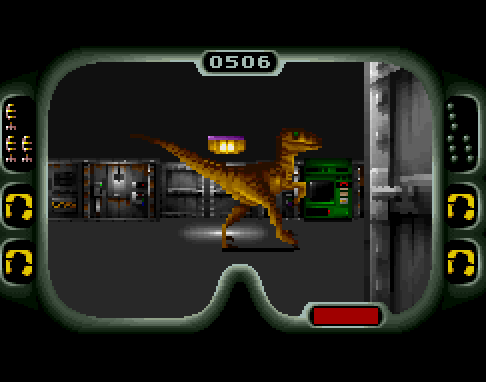 The game is a lot easier and friendlier that Doom though, most enemies are either raptors, that spitting dinosaur, or one of two T-Rex roaming the park. They generally wont attack you indoors unless you enter the same room as them or get to close. With the exception of the raptors nesting area. Oh, and the fact that you only get four lives, and two continues, and you have to complete the game in one sitting because there is no save feature. Enjoy. When you enter a lift, you are given options to select the floor you want by pressing B or using the right click. Right click? What, of the mouse? But I’m playing this game on the SNES. So, after a bit of searching, I discovered that the game is compatible with the Super Nintendo Mouse. I had no idea it existed, nor had I any idea why I would want to use it to press a lift button instead of just pressing B. Well, you can also use it to open up computer panels and power up generators along with other devices, provided you can handle large pop ups of Dennis making the ‘Ah, Ah, Ah,’ noises. The raptors nest is vicious. You can be attacked by raptors, glitched raptors, or get trapped in a grey glitch land forever! On one play through, a raptor ran out of a concrete wall that had the Jurassic Park logo on it. I dodged the dinosaur and ran, straight through the wall, into a grey area that i could still move in, could still shoot in, could still see raptors in, but could never escape. This was after playing the game for two hours, I had to start over, not so fun. Yet another time I did it on purpose, and did manage to get back into the game area, right to an exit that I needed, saving me the hassle of eradicating every dinosaur in the place. You could have a lot of fun playing this game for its sheer weird mash up of game play, or you could become frustrated with it early on. There is definitely nostalgic replay value to it, but other than that maybe look online for a decent ‘lets play’ of it. After this game, I expected as much weirdness from Oceans second game, Jurassic Park: Part 2: the Chaos Continues. Keep an eye out for my thoughts on that one.